He may have an on and off singing career but Manny Pacquiao still does his best work in the ring. Hard to believe that it’s been ten years since he won his first world title. To commemorate the roller coaster ride that Pacquiao has taken us, I made a list of my ten favourite fights. This is an exercise in subjectivity and I am aware that Pacquiao has his own list of favourites. The reader, I am sure, has his own and may find his favourite fight not included or disagree with the ranking or my opinion of the fights. Sports debates always make good conversation pieces in coffee shops and beer houses. - No titles involved and looked like a mismatch on paper. But youth and speed trumped size. I don’t think this generation will see another Filipino involved in a fight of this magnitude. Pacquiao also does a Henry Armstrong-like feat by fighting in three weight divisions in one year. - Titles are won and lost inside the ring and not in the conference rooms of the alphabet organizations. Pacquiao became World Featherweight Champion on this day when he gave a dominating performance against a man already considered a legend. The Bible of Boxing, Ring Magazine, in their world title lineage does record Pacquiao as winning the World Featherweight title. - Pacquiao elevated himself to another level to beat El Terrible in the second chapter of their trilogy. Revenge is tasty served hot or cold. He is the only man to knock out Morales. - 13 days shy of his 20th birthday, Pacquiao wins his first world title – the WBC flyweight crown - with a come from behind win after being outboxed by the Thai champ in the first six rounds. - Marquez had the WBA and IBF featherweight belts and the reputation of being one of boxing’s best counterpunchers. Pacquiao had the Ring magazine belt and lingering questions from boxing fans and writers as to whether the Barrera victory was a fluke or not. Pacquiao showcased his power in the first and sent Juan Manuel to the canvas three times. Marquez clawed back and outboxed Pacquiao the rest of the way. A controversial scoring aberration robs Pacquiao of a split decision win. - If there were still any doubters out there Pacquiao silenced them with a performance that was Tyson-like. - The Americans could not even pronounce his name properly but Pacquiao introduced himself not by shaking the hands of the broadcasters but by carpet bombing his South African opponent and taking his second world title – the IBF superbantamweight belt. - It took them four years to stage a rematch. JMM’s WBC superfeatherweight belt was on the line. Marquez already knows how to fight Pacquiao and starts with a boxing lesson. Pacquiao responds with a howitzer and drops Marquez in the third. The fight turns into a classic as both fighters showcase their best – Marquez’ surgical counterpunching and Pacquiao’s blazing but sporadic rapid fire attack. - Ring magazine editorial staff grudgingly gives Pacquiao his second linear world championship belt: "We thought Marquez won but we'll hand Manny the belt." - Pacquiao wins the WBC lightweight belt in a one-sided contest and smashes the jinx that beleaguered Flash Elorde and Andy Ganigan. Pac Man wins his fifth world title. - This fight is meaningful not because of who he beat but because of what was happening in the Philippines that same day. - I’m talking about the Oakwood Mutiny. Pacquiao was a few hours away from making the fourth title defense of his IBF 122 lb. crown when a group of military officers called the Magdalo staged an uprising against the Arroyo administration and holed themselves up in the Oakwood Apartment Towers in Makati City. - I was just a couple of blocks away from Oakwood on that fateful day. 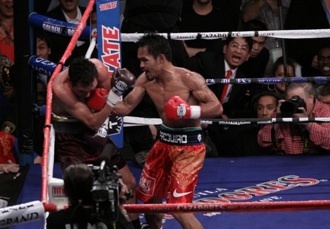 Pacquiao on the other hand pummelled Lucero and gave us something to cheer about amidst the unrest. It is quite a resume. The only boxer that casts doubts is Juan Manuel Marquez. I would love to see them fight a third time even outside the ring in a dark alley or abandoned warehouse. But it seems Ricky Hatton is getting more attention right now. Pacquiao does have his political plans but we hope he will produce more hits in 2009 before he hangs up his gloves for good. Photo: Pacquiao (R) batters De La Hoya on Dec. 6 in Las Vegas.